Payá Hermanos, S.A. was the leading Spanish manufacturer of tinplate model trains. The company began in the early 1900’s in the town of Ibi, Spain located in the mountains north of the Mediterranean port of Alicante. Village tinsmith Don Raimundo Payá started out making simple and inexpensive clockwork toys. His first metal toy was a hand-painted horse drawn coach. The business grew rapidly and the firm Payá Hermanos S.A. (Payá Brothers S.A.) was formed and built their first toy factory in Ibi, where toy manufacturing began in 1906. It became a family run business with four brothers managing the firm, hence the name- Payá Hermanos. The first trains were inexpensive trackless floor toy clockwork and pull-toy sets. The company eventually became well known and gained lucrative contracts to produce toys for the famous German and French toy makers. At the same time, they produced a wide range of toys for the domestic Spanish market, and became a serious rival to the imported toys. During World War I, even though Spain remained neutral, there were no German, French, or British toys being imported. As the domestic demand for toys increased, Payá met these needs and sales increased significantly. It was at this time that they began to produce simple mechanical train sets and models that ran on ‘O’ gauge track, of their own original designs. The first train sets included an 0-4-0 steam outline locomotive, tender, and one or two cars. The cars all utilized a common frame with four wheels. Payá was one of the first to introduce lithograph printing to Spanish toy production and Payá’s imprints were colorful, bright, and bold. Payá’s first catalog to include trains was issued in 1920. It was printed in full color, and also advertised the famous horse-drawn stage-coaches and street-cars. After the war, foreign competitive trains, primarily German made, began to reappear in the Spanish market. However, this did not deter the Payá line from growing as they continued to produce the less expensive and simple line of wind-ups through 1925. It was at this time that their first electric locomotives were manufactured. These new models introduced an era of much higher quality trains with even better lithography. These premium trains were sold in sets with detailed passenger cars. Payá passenger coaches came in both two and four axle versions and were offered in a variety of sizes. They were based on the French PLM (Paris, Lyons, & Mediterranean) Railway of the period. 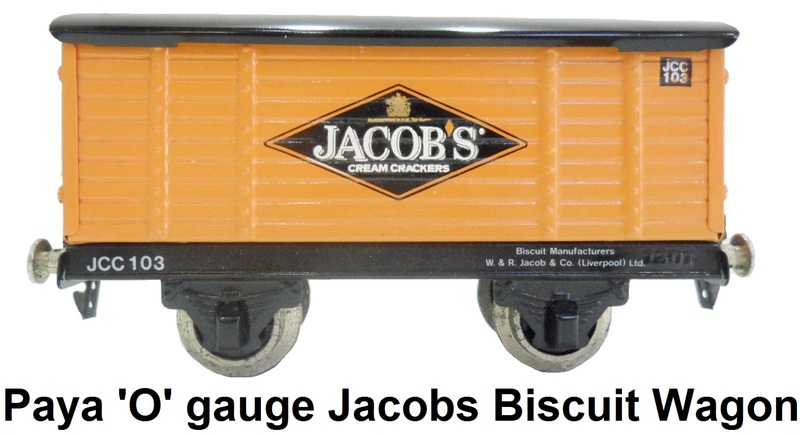 Only one freight set was ever produced with only 3 freight wagon types ever cataloged - a simple tank wagon, an open goods wagon, and a covered goods wagon. Payá continued to make clockwork locomotives but added features such as battery operated lighting. The first electric 3-rail locomotive was the #984, a small 0-4-0 steam outline locomotive with a two axle tender that would remain in the catalog for the next 30+ years. A larger deluxe clockwork 4-4-4 steam outline locomotive was also released. By the 1930’s Payá began offering accessories such as tunnels, switches, signals and stations to complement the trains. They had become the best-known Spanish manufacturer of tin plate toys and now employed 500 workers. In 1935 Payá introduced a three unit articulated model of the Union Pacific M-10000 streamliner. The prototype of this train had just started service in the United States the year before in February 1934. Lionel, who had blueprints of this streamliner and had been working on their version, introduced their model later in 1934. The Payá model was 83 cm long and included a lighted interior. Also in 1935, Payá created the #987 locomotive which was very close in appearance to Lionel’s #1681-E 2-4-0 originally made in 1934. In 1936 Payá's growth came to an abrupt stop with the start of the Spanish Civil War. The company was nationalized and toy manufacturing was suspended. The factory was converted for the manufacture of armaments and shell casings. When the Civil War ended in 1939 Payá resumed toy production but the lack of finances kept Payá from being able to introduce new products. 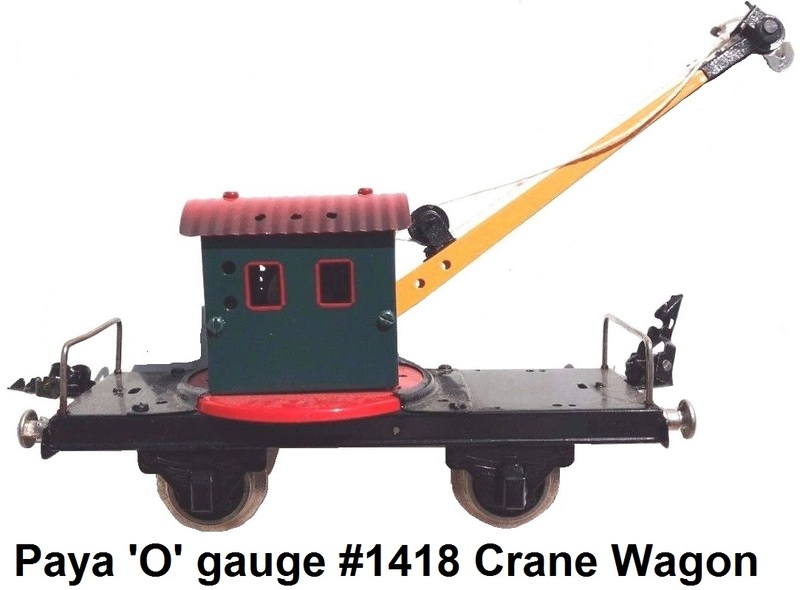 Payá continued making the same toys they made prior to the Civil War and fortunately, by 1944 they were able to develop and produce a brand new line of even more realistic looking ‘O’ gauge trains. As the war in Europe was winding down in 1944, Payá produced their 2-6-2 Santa Fe steam outline locomotive. This was a 3-rail, 18 volt AC, tinplate/die cast locomotive measuring almost 50 cm (18.5 inches) long. It was a simplified model of the large Santa Fe 2-10-2 locomotives belonging to the Spanish National Railways (RENFE). To enable this locomotive to better negotiate the narrow radius curves of tinplate track, Payá made the Santa Fe in a 2-6-2 wheel arrangement rather than as a 2-10-2, like its prototype. Other than this modification, the Payá Santa Fe did match its prototype well, and was outfitted with smoke deflectors, sprung buffers, red wheels, and a mechanism to puff smoke. It was accompanied by a unique covered tender. The Santa Fe served as Payá’s top-of-the-line locomotive and, until 1984, was the only steam locomotive produced with more than two drive axles. The locomotive was complimented with the Series #1376 4-axle passenger coaches that were 35.5 cm in length and Series #1371 coaches that were 30 cm in length. 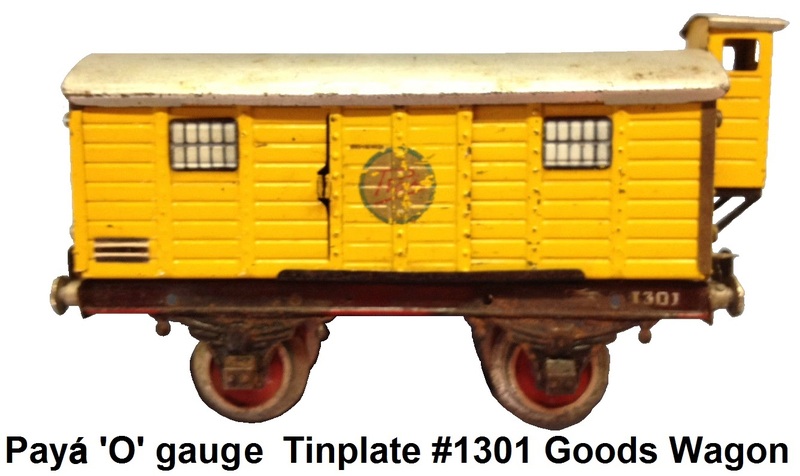 The #1376 coaches were developed from an earlier coach (the Series #883) by adding die cast end pieces to simulate the bellows attachment between the cars. Each of the cars had its own interior lighting system. A unique 30 cm postal van was also part of the new passenger consist. Payá also expanded its range of stations, signals, bridges, cranes, and rail side accessories. The stations were now offered in kit form so that they could be assembled by the hobbyist. Station parts were sold separately so that a wide variety of stations and trackside buildings could be created. Also in the 1940's Payá stopped the use of lithography and increasingly painted and baked their items. Up until this time ‘O’ gauge was the predominate gauge of trains made at Payá, but in 1948 they started producing 2-rail “S” gauge trains (1/64, 22.23 mm gauge). 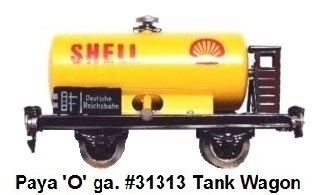 Also in that year the first ‘OO’ gauge train was produced. 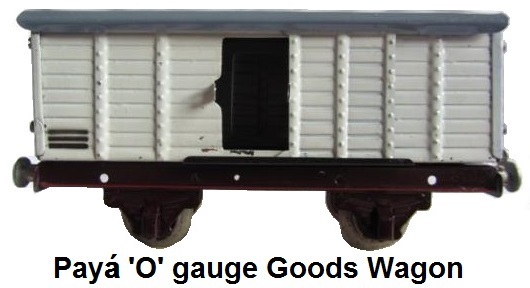 Between 1959-1960, the ‘S’ gauge models were converted over to HO. 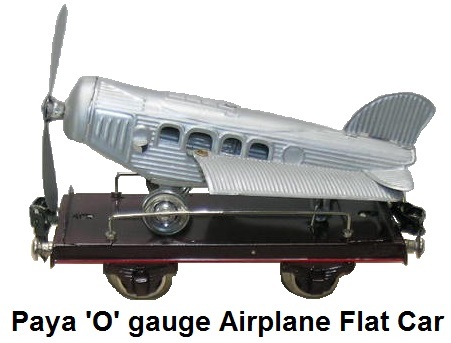 By the 1950’s HO became the predominate gauge, but Payá continued to produce the same ‘O’ gauge items that made them famous, well into the mid-60's. Payá was the last European company to produce ready-to-run, ‘O’ gauge trains. The Santa Fe locomotive and some of the 4-axle wagons were produced on a commissioned basis into the 1970's. Initially the HO gauge trains, like the ‘S’ gauge models before them, ran on two rail track with DC power. In an effort to compete with, and be compatible with Märklin trains, Payá converted their HO trains to run on three-rail track. In 1984, after a period of financial difficulties and a long standing labor dispute, the Payá family turned the company and its assets over to its employees. A cooperative, la Sociedad Payá Juguetes, Sociedad Cooperativa Limitada (Payá Toys Society, Cooperative Society Limited) (Payá SCVL) was formed by the employees. 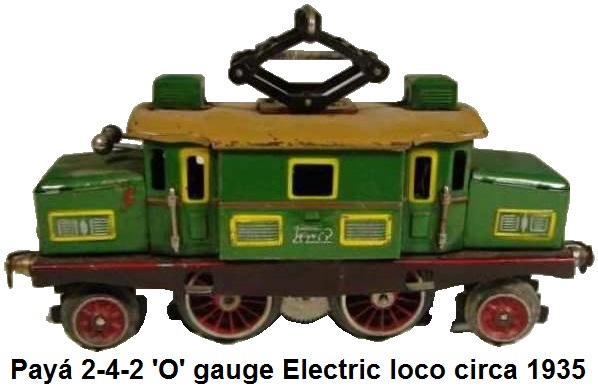 With few resources available to retool and manufacture new toys and trains, the new company decided to focus on the toy collectors market and reproduce, in limited quantities of 5,000 each, a selection of their more interesting and popular toys and trains of the past, using the original machines, tools, and dies of the past. The reproduction toys were numbered and provided with a certificate to demonstrate that they were genuine. To guarantee their exclusivity the original tools were said to have been made unusable after the reproductions had been made and then the original toys and tooling were donated to the Valencia Toy Museum. Payá did not provide this certification process to the trains. The Santa Fe steam locomotive was the centerpiece of the Payá reproduction trains. Originally produced only in black, the reproduction model could be purchased in maroon, green, and blue color schemes as well, although it is unlikely that the actual 2-10-2 locomotive was anything but black. Forty years after its initial release, this model locomotive was produced again and marketed in the United States for several years. 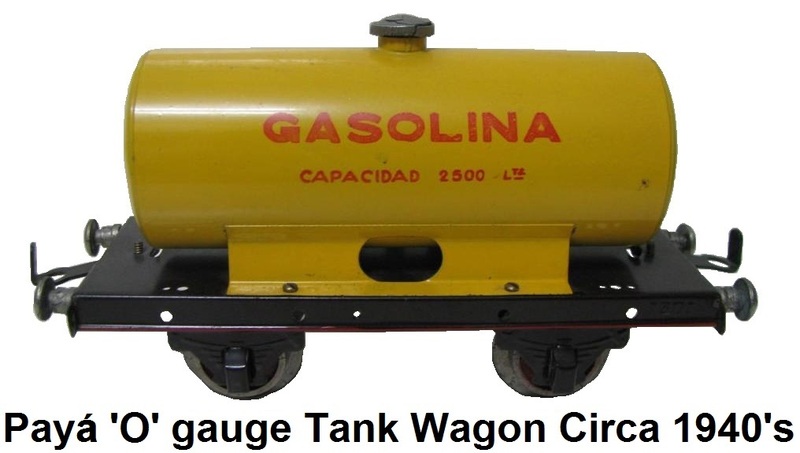 This elaborate Santa Fe model locomotive served as an introduction to Spanish toy trains for many toy train enthusiasts who knew little of the history of Spanish toys and trains. 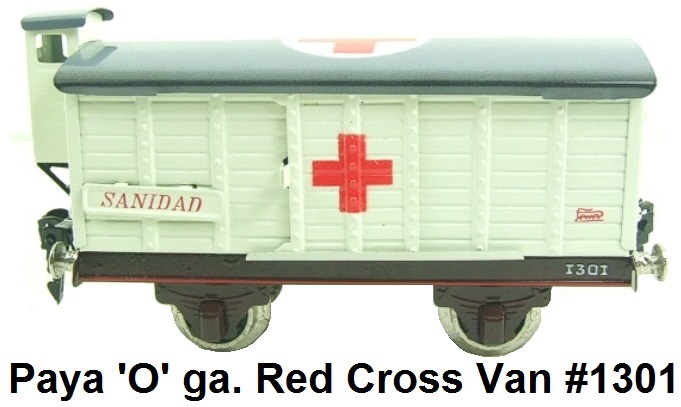 Payá frequently reproduced the trains in new colors and markings that were not found in the original form. The #1376 series of 35.5 cm long passenger coaches produced in the late 1940’s for the Santa Fe locomotive originally consisted of only a few coaches (1st, 2nd, 3rd classes and restaurant/sleeper combinations). In the reproduction program these were expanded to at least 12 coaches, including the liveries of the Orient Express, MITROPA, and Rheingold lines. Payá advertisements from the late 1980’s also feature a 2-6-4 steam locomotive, called a Baldwin loco. Targeted at the American collector, the locomotive was a derivative of the Santa Fe loco using the same boiler and cab, but without the smoke deflectors. It featured a new front end with an American styled front and pilot. The production of this locomotive was limited due to problems experienced with the molds and this model is very hard to find. 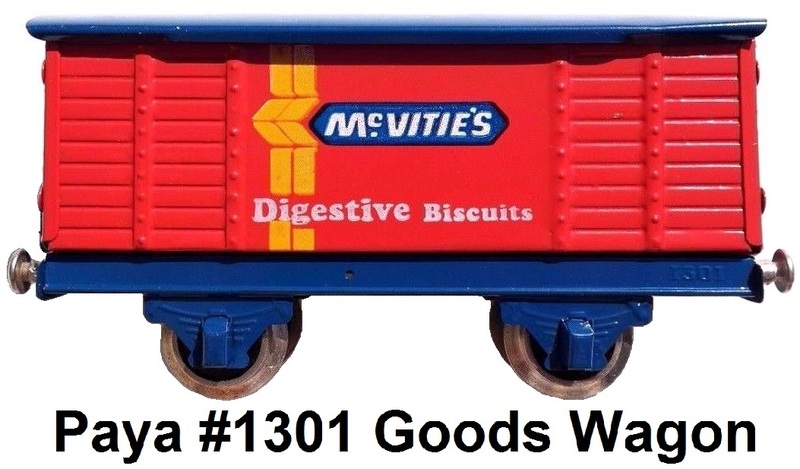 Payá expanded the number of two-axle freight wagons available via multiple paint schemes including a couple of private owner goods wagons, such as the Jacobs and McVities vans. The Payá tank wagons could be filled with water via a top screw hatch and drained through a spout located on the side of the tank wagon. Payá provided the wagons with couplers that were compatible with the original Payá trains as well as compatible Märklin and Hornby couplers. These Payá reproductions hit the American train market in the late 1980's. They were imported into the U.S. by Reeves International of New York, between 1988 and 1990, and were sold by 100 toy and train dealers across the U.S. The trains were also available from several European sources and for a time, Payá trains could easily be found at the major train shows and meets. Payá continued in the toy and toy train business on a much smaller scale up to 2009 when it finally stopped producing toys and ceased doing business. Their final toys, produced in an arrangement with another company, were reduced sized reproductions of original antique toys called the “Juguetes de Antaño” (toys of the old days). Although the company Payá no longer exists, the city of Ibi continues to be a major source of toy production. Most of the Spanish toy companies, such as RICO and Verdu & Cia, were started by former employees of Payá Hermanos and are located in Ibi. It also is the location of the famous Valencia Toy Museum which houses many Payá tools and toys as well as toys from other early toy makers. In their early years, the Payá brothers acquired a great number of Spanish and foreign toys which they examined to understand the competitions’ design, construction, and quality features. Typically two samples of the best toys were acquired during travels to foreign countries. One sample was for examination, the other one was conserved as a sample. Eventually this valuable collection of tinplate toys was donated by Payá SCVL to the Valencia Toy Museum where they can be enjoyed today. Unfortunately, due to poor aging of the original materials, today most of Payá's early trains are warped and swollen and do not run well. Payá trains also suffer from casting failure (zincpest). For today’s train collector it is difficult to find original (i.e., pre 1960's) Payá trains in good and operable condition. Die castings were extensively used for details, trucks, buffers, wheels, and motor parts and they suffered significant metal fatigue due to impurities in their castings. However, reproduction parts of new materials are available today, produced by Payá fans much like the parts produced today for Hornby ‘O’ gauge trains. The later Payá reproduction trains from the 1980’s also tend to have issues with metal fatigue in the die cast parts used for detail. It is common to experience cracked and broken parts on both the Santa Fe locomotive and the 35 cm coaches. Many of the die cast parts were painted silver and it is common to find this paint flaking off. The 2-axle trucks on the larger freight wagons and passenger coaches do not roll smoothly on the track and require some effort to get them to roll with little friction.